We are pleased to be able to offer here our first ever Guest blogger!! We hope that you enjoy her blog post!! 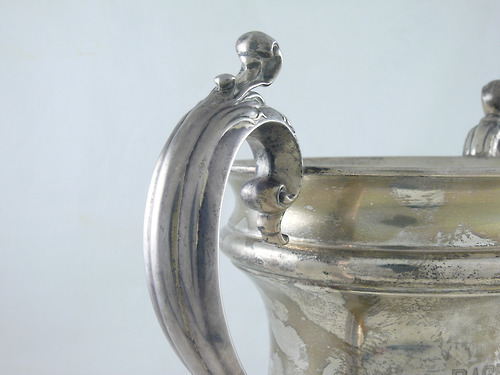 Many of us who are antiques dealers love the history that is connected to the objects that we find as much as we love the excitement of the treasure hunt. Many interesting antiques are not acquired with their histories attached unless it was bought from the original family. Even then the history is often lost or misremembered. Thus it becomes our task to find the history and reconnect it with the object. In 2013 we acquired an elegant sterling silver baseball trophy which had no information as to its history other than what was engraved on its sides. 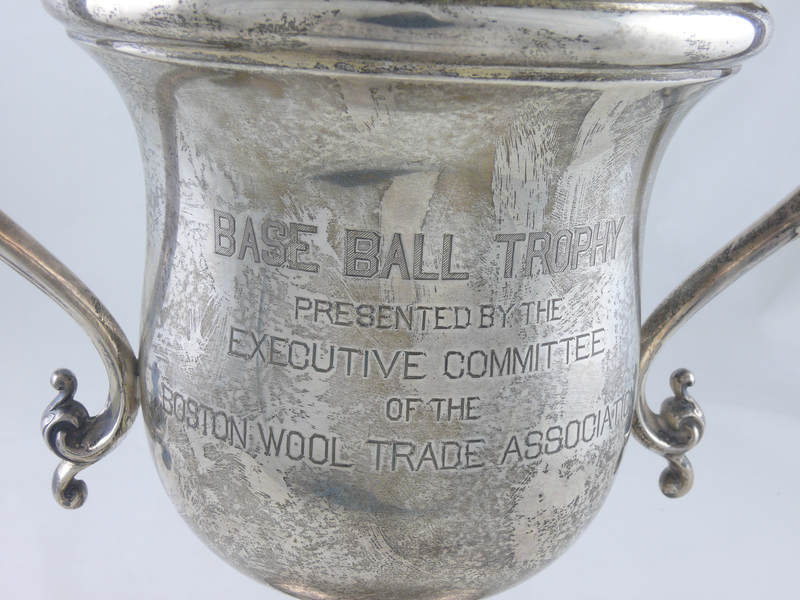 The trophy is engraved on one side with the following: “Baseball Trophy Presented by the Executive Committee of the Boston Wool Trade Association”. On the other side is engraved, “August 28, 1912 Boston 1 Philadelphia 2 Sept, 19. 1913 Philadelphia 19 Boston 2 Sept. 15 1916 Boston 17 Philadelphia 3″. Under the base it is marked Sterling with the eagle hallmark of the Meriden Brittania Company of Meriden, Connecticut. It is also marked “862″ “5 1/2 Pts” “11 1/2 IN”. We had a lot of questions about the trophy that we set out to answer. These days with the ability to research expanded greatly by the wealth of information that is on the internet, we were able to learn the full story of the trophy: who made it, for whom it was made, and something about what it was like in America at the time it was made. After some time spent researching it on the internet, I discovered quite a lot about it. Often there was only one document that provided a piece of information but after finding several articles from early twentieth century publications, I put together, piece by piece, quite a bit of history of the trophy. 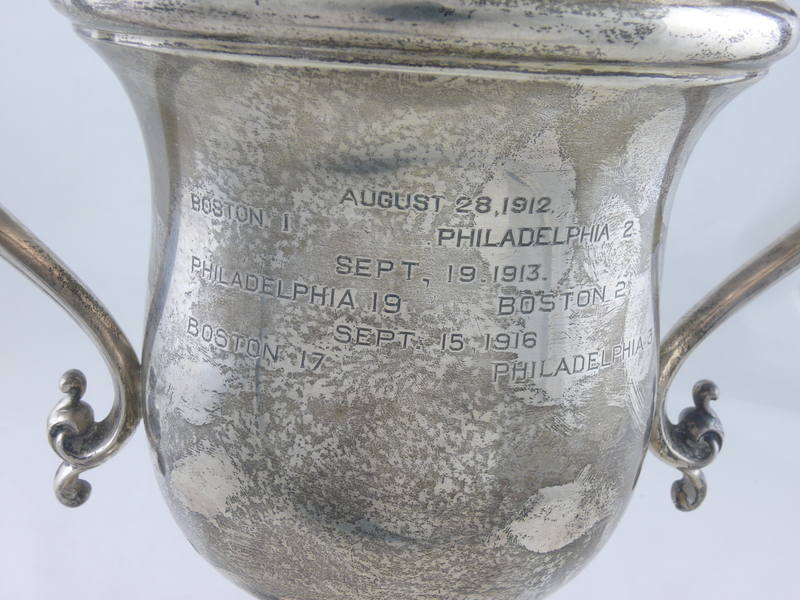 The trophy was presented to the winning team of games that were played between the Boston Wool Trade Association team and the Philadelphia Wool and Textile Association team in 1912, 1913, and 1916. The Boston Wool Trade Association was formed in November 1911. At their first annual outing in Boston in August 1912 members of the Philadelphia Wool and Textile Association were guests of the Boston association. Golf, tennis and a baseball game were on the schedule of activities. The baseball game was played between the Boston Wool Trade baseball team and the Philadelphia Wool and Textile Association baseball team. 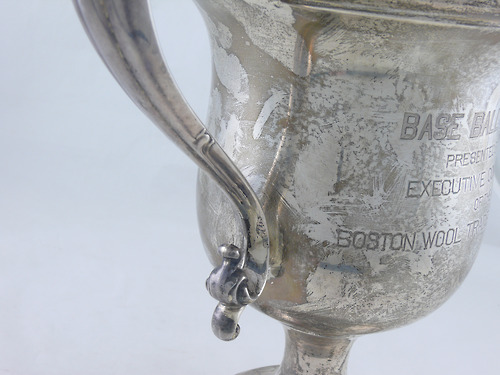 This silver trophy was presented to the winning team by the Boston Wool Trade Association. It was donated by Charles J. Webb of Philadelphia. Mr. Webb was one of the organizers of the Philadelphia Wool and Textile Association and held the office of treasurer for that group. The Philadelphia team won the game. The score was 2 to 1. The second outing was held in Philadelphia on September 19, 1913 where the Philadelphia Wool and Textile Association played host to one hundred and seventy five members of the Boston Wool Trade Association. The two associations alternated where the outing was held between Boston and Philadelphia. A program of activities that included golf, tennis and baseball as well as field sports such as relay races were on the program for each outing as well as a dinner and speeches. That amusing observation was apparently due to the rather large margin by which Philadelphia had won the game. The textile groups’ 1916 outing was in Boston on Friday, September 15, 1916. Six hundred were in attendance which was considerably more than the 470 who were expected to attend. One hundred and twenty five to one hundred and fifty were members of the Philadelphia association who were guests of the Boston association. The outing was held at the Tedesco Country Club, Phillips Beach, Massachusetts with dinner at the Copley Plaza Hotel. There were 550 reservations made for dinner. The Boston team won with a score of 17 to 3. We noticed the absence of the years 1914 and 1915 from the trophy which seemed unusual as it was an annual outing. We did further research and learned that the Executive Committee of the Boston Wool Trade Association canceled the 1914 outing “owing to the terrible conditions now prevailing in Europe and which are liable to grow more serious in the near future.” They stated: “… our local trade as well as our Philadelphia guests could not feel fully justified in attending a day’s festivities with the world’s greatest conflict being enacted almost before their eyes.” The outing must have been canceled again in 1915, probably for the same reason. In the lengthy description of the 1916 outing found in the September 23, 1916 issue of the publication “Textile World” the 1913 outing was mentioned several times but there was no mention at all of a 1915 outing. Nor was there mention of the war in Europe. In looking for further references to the groups’ outings after 1916, the next one that I could find was in 1920 when the format of the baseball games played was changed to a series of five games, two of which were played in Arlington, Massachusetts at Spy Pond on September 11 and three in Philadelphia at Fleisher’s Field on September 17, 18 and 19. 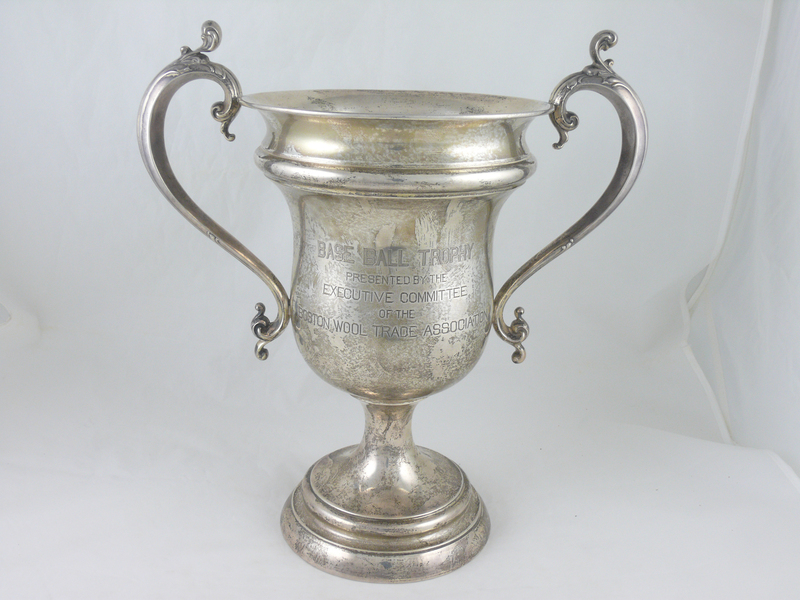 As no dates beyond 1916 were engraved on the trophy, we have concluded that the entry of the U.S. into the war in the spring of 1917 resulted in the groups canceling their annual meetings again and that the meetings were resumed after the war was over. In 1922 the tenth annual banquet of the Boston Wool Trade Association was held on March 2 at the Copley Plaza in Boston and was attended by 900 members and guests. They had a banquet. speeches, men in ballet outfits jumping out of fake bales of wool, piano playing, making witty repartee, and lampooning prominent members of the wool trade in a mock trial. No sports were on the program. At the banquet they provided a memento in the form of a booklet stamped in gold “1912-1922” which contained the banquet menu, list of association officers, guests, and members and a facsimile of a 1894 letter about the idea for the association. From the scheduling of the 1922 meeting it is clear that they had decided to hold their meetings in the spring rather than in late summer. And that they no longer included golf, tennis and baseball in the program, sports which would have been impractical to play in March in Boston when snow could still be covering the ground. Thus there would have been no more need to use a baseball trophy as an award. Due to the trophy having been part of an event where business and events of the time were discussed and then later reported on, our research on the history of the trophy and the textile associations brought up articles that described the political climate of the time, the working conditions of textile workers, the role of unions, the change in hours of the work week, the impact of war, and the concerns of those in the textile industry regarding the environment, politics, business, and law. Some of what concerned them then, particularly issues about the environment, were the same things that concern us now. Other matters, like the reduction in the maximum hours to be worked in a week to forty-eight, were a reminder that there was a time when working conditions in this country were far tougher than they are now and that people took it for granted so much that there was controversy when changes in the law were proposed. This entry was posted in Uncategorized and tagged antique, baseball, baseball trophy, Boston Wool Trade Association, guest blog, Philadelphia Wool and Textile Association. Bookmark the permalink.